Super-sensitive, intolerant skin types rejoice! Avene Skin Recovery Cream soothes, relieves irritation and protects reactive and delicate skin types. The preservative- paraben- and fragrance-free formula is guaranteed gentle. For those with extremely sensitive, damaged skin. Parcerine calms and strengthens the skin. 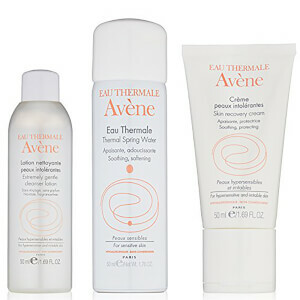 Avene Thermal Spring Water soothes and hydrates. Avene Thermal Spring Water (avene Aqua), Mineral Oil (paraffinumliquidum), Glycerin, Glycerylstearate, Squalane, Cyclopentasiloxane, Clycohexasiloxane, Serine, Carbomer, Tetrasodium EDTA, Triethanolamine, Water (aqua). This is the best soothing cream and great for any sensitive or irritated skin. Lifesaver for me as well! This product is heavier than I expected, so I only use it at night. Feels great and doesn't irritate my sensitive rosacea skin. I purchased this for my Granddaughter because she has very, very sensitive skin. She LOVES IT. She thanked me for introducing her to Avene. She is soon to be 22. Her skin is beautiful. Love SkinCareRX and their fantastic sales. This cream is a life saver for me... When every other skin care product is too irritating for me, this is the one I go to. Good for my sensitive skin! Highly recommend! Save it for autumn use again.